Anyone can see the place where her sister and partner died. It's near the sharp turn in the road, the place where the car flew across the river. They had to tell her before the newspapers published the headlines. Life-changing, incomprehensible and devastating. That is how it felt. She had never been truly aware of her own mortality until Zoie died. When she lost her husband to depression and suicide, and her family lost her brother to brain cancer, she realised how brutally short life could be. In anger, fear, sadness, grief and loneliness, she questioned, why was I still alive when they were not? Why had they died? If I was here, then what did that mean? She decided it must have meant something. Grief changes your landscape, but it does not define you. Written after her mother's deterioration to Alzheimer's and her father's diabetic experience at death's door, her memoir style book is an unwavering account of how all sense of meaning in life can be lost, and how we can reshape our lives. We can live a meaningful life alongside grief, moving through it, rather than seeking to overcome it. Hitting My Reset is an utterly compelling story of one woman's altered landscape. A book for grieving people, for those who love them, and each other. Grief hurts. It's hard to go through, and painful to watch. This book will be relevant for many years to come. Lisa Gallate is a senior commercial litigator and class actions lawyer with a top tier global law firm. She holds a Master of Laws from Cambridge University, England and undergraduate law and commerce degrees from Victoria University in Wellington, New Zealand. She was a finalist for the Australian Women Lawyers' Association "Woman Lawyer of the Year 2015", and through her marathon running and fund raising, supported many charitable causes, including the Cancer Council, the Asthma Foundation and the Cure Brain Cancer Foundation. Lisa resides on the beautiful Northern Beaches of Sydney, with her husband and three children. 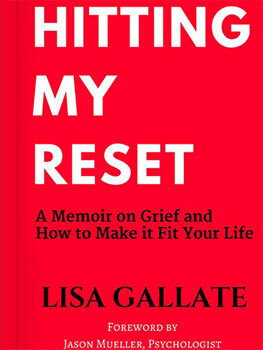 Lisa Gallate is the author of Hitting My Reset, a memoir on grief and how to make it fit your life. It is a stunning book exploring an intensely personal yet universal experience: on death, brain cancer, depression, miscarriage, dementia, diabetes, Alzheimer's Disease and Parkinson's Disease"and a life, in good times and bad"that will speak to anyone who has ever loved a sister, brother, parent, husband or wife, or child. She writes to inspire people who have been through their own challenges of grief, and shares some of the insights she has endured dealing with such a hard-hitting subject. She is an inspiration to many and all who know her. The world death rates show that 55.3 million people are dying each year. The World Health Organization's Global Health Observatory reports that diabetes caused 1.6 million deaths in 2015. Deaths due to dementias more than doubled between 2000 and 2015, making it the seventh leading cause of global deaths in 2015. Injuries continued to kill more than 5 million people each year, with road traffic injuries claiming about 3,700 lives each day. These statistics are proof that the author is not alone in her grief. Lisa is a powerful narrator with the skill of a lyricist. Her near incomprehensible experiences of personal heartbreak is expressed through her narrative"combining her knowledge of the craft"her writing invites readers into a literary world of understanding grief and life from a new perspective. She writes electric honest prose, for those of us who believe in the transformative power of the human spirit and for those of us who believe in love.